Great bedside manner, personable and friendly. Helped me with my ingrown nails, Dr. Aslanian numbed my toe and made sureI was comfortable before proceeding. I was already nervous before coming to the office, but I would highly recommend her! Great bedside manner, personable and friendly. Helped me with my ingrown nails, Dr. Aslanian numbed my toe and made sure I was comfortable before proceeding. I was already nervousbefore coming to the office, but I would highly recommend her! The whole staff was friendly, thoughtful and efficient. Dr. Aslanian listened to my concerns and asked questions to gaininformation she might need. The whole staff was friendly, thoughtful and efficient. Dr. Aslanian listened to my concerns and asked questions to gain information she might need. 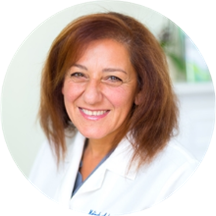 Melineh Aslanian is a dedicated, friendly podiatrist serving the Glendale and West Covina communities of California. She is a graduate of Samuel Merritt University, California College of Podiatric Medicine and completed her residency in podiatric surgery at Bellwood General Hospital. Dr. Aslanian treats major and minor problems in adult and child patients in a friendly and comforting environment. A few of her most common procedures include treatments for hammer toes, wart removal, ulcers, cast fractures, and mass removals. Dr. Aslanian also treats more severe issues such as deformities and injuries. She uses a new technology, the Hyper Blue 1530 Laser to treat ingrown toenails, fungus, and other issues with minimally-invasive techniques. In addition, her office provides over-the-counter items such as shoes and creams in-house, for a one-stop-shop approach to podiatric needs. Committed to continued education, Dr. Aslanian attends podiatric conferences and seminars yearly and is active in the American Podiatric Medical Association and the American Diabetes Association. Outside of work, Dr. Aslanian enjoys volunteering, running, reading, and yoga. She is fluent in English, Spanish, Farsi, and Armenian. Dr. Asianian was very specific, asked important questions and recommended a solution to my pain. She was able to tell me what was wrong with my feet and why I am having so much pain. I was very pleased. Dr. Aslanian was so kind and she really cared about taking the right approach to get the best results. I would absolutely go back to her! Dr. Melineh is the best! Highly recommend! Dr Aslanian was very helpful and thorough. I would highly recommend this doctor for any foot or ankle issues. Very kind and understanding. I traveled 25 miles to see her and she was well worth it. Made me feel comfortable and at ease during the entire appointment. The staff too were very professional, friendly and curteous. Dr. Melineh Aslanian was very patient, pleasant, and knowledgeable. Wait time was excellent and provided great treatment options. I would highly recommend her. Dr. Aslanian was sweet, attentive and made me feel like she was really listened and understood my questions and concerns. Her office staff was equally as amazing and sweet. I wish all my doctors were as great as she is! She's nice and kind and very experienced. Your feet are in good hands! Patient, Knowledgable, and no wait time. She is a very caring and personable doctor. I would highly recommend her. She took the time to listen to my questions and was very considerate. She did a great job diagnosing and treating my foot problem. After several years of pain, I have been pain free for a few weeks now. I should probably wait to see how my laser treatment works, but I was very happy to find a podiatrist with a sense of humor for one thing. Dr. Aslanian was also knowledgable, professional and got right to work on my problems. She is an angel. Always takes time. Warm, caring, and efficient treatment. I highly recommend her. She is excellent. Very knowledgeable, professional and in the same time friendly. I am highly recommending her. I don't do well as a patient, but this doctor put me at ease right away. I'm not interested in surgery, and Dr. Aslanian provided me with some conservative options. Laser pain treatment is one of them. I am so happyI found this podiatrist. As a runner and an athlete, I appreciate Dr. Aslanian's approach. A definite keeper! The doctor was knowledgeable and friendly. The office staff was competent. I loved the on line check in before my appointment. The parking lot has a lot to be desired especially if your foot hurts. You have a lot of walking to do. Love Dr. Aslanian. She is really nice, knowledgeable, and quick! I had to have a toe nail taken out and the doctor made the experience very easy and peaceful. She is a lovely professional. I adore Dr. Aslanian. She is always so light about everything and even though you come in with pain she takes care of you right away and does her very best to make it as easy as possible. I always feelgood inside and out after seeing her. She is thorough and kind. A perfect podiatrist! Amazing! Very impressed by her attention to my medical needs and the complications I have suffered from my diabetes. Not only did she treat my problem, but she gave me more advice in one day than my own PCP has inthe last couple of years! Love Love Love her! Cannot wait to see her again in February. Dr. Aslanian was calm and knowledgeable. She had good rapport with our son and being a marathon runner herself helped with the way she handled our son who had a running injury. She demonstrated such unflinching dedication to my wellness that I was inspired. I highly recommend her! I was pleased with her professionalism and at the same time her kindness and sympathy....Her understanding earn her my trust and I actually recommended her to one of my friends that has some problems with her feet!!! Doctor was very gentle, very professional. Get receptionist was accommodating and friendly. I felt cared for and comfortable. I highly recommend Dr. Aslanian! Very friendly and informative, even though she had to remove my toenail which isn't fun, she was very caring and concerned with my level of comfort and the procedure was done in less than 10 minutes. I will def come back to her should future problems occur. Dr Aslanian is incredibly pleasant and accommodating! Swift, efficient and told me what I needed to know. Extremely helpful. I really enjoyed my visit. She takes her time and is very Knowledgeable. I will continue to see her for other items like my ankles, knees and back. Didn't know she could help with that too. I found Dr.Aslanian to be personable, engaging, truly interested in what I had to say, careful to be sure all ground had been covered, willing to adjust to the direction I was inclined rather than push any agenda she might have(which I doubt)- & Very nice. A delightful visit & a lovely person. I highly recommend Dr. Aslanian! The office is clean and modern. I was seen immediately. Doctor spent a lot of time with me, listened and gave me straight answers. Being a runner herself, Dr. Aslanian gave me some great tips forbuying running shoes to prevent further injuries. Friendly staff and great service. I couldn't have asked for a kinder doctor. Dealing with foot issues is no walk in the park :) Dr. Aslanian did everything to make me feel relaxed and cared for and explained my situation in detail and answered my questions.I have a foot doctor for life! I highly recommend her to anyone who has concerns about their feet. She was extremely thorough and took her time. She explained a lot, and was very pleasant, as was her staff. I would definitely recommend her to anyone who needs a podiatrist, or is experiencing any type of foot, knee or hip pain. Excellent! Perfect. Was seen in less than 10 minutes. Immediately took out my ingrown toenail. Was very gentle, personable & kind. Took extra precaution to make sure the morphine was injected correctly. 100% satisfied. Very nice. Took her time and listened and gave simple advice. I didn't had a big problem so can't tell more. Great doctor -- very thorough and present. Highly recommend!